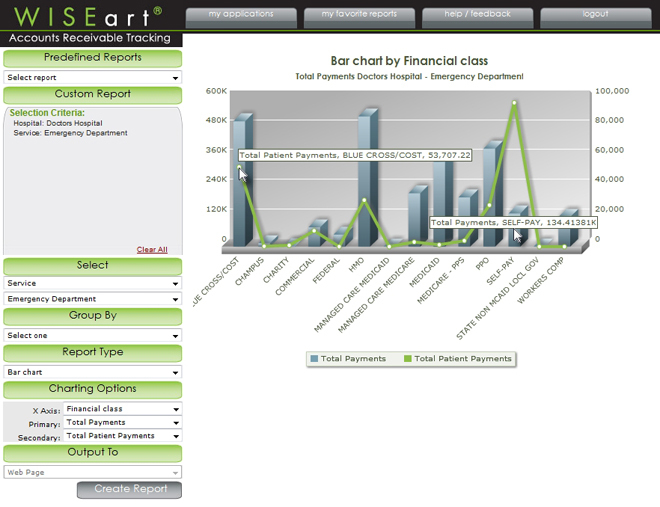 WISEart tracks in-house accounts receivable to help hospitals/physician practices identify cases that may result in bad debt or charity care write-offs. Managing accounts receivable—typically the largest and most significant asset of all healthcare providers—helps you to take all possible steps to make sure that optimal reimbursement takes place. Detailed accounts receivable information consolidated from multiple stand-alone facility/practice systems on a daily basis can be used to monitor, analyze and proactively identify opportunities for resolving accounts before they go to bad debt. 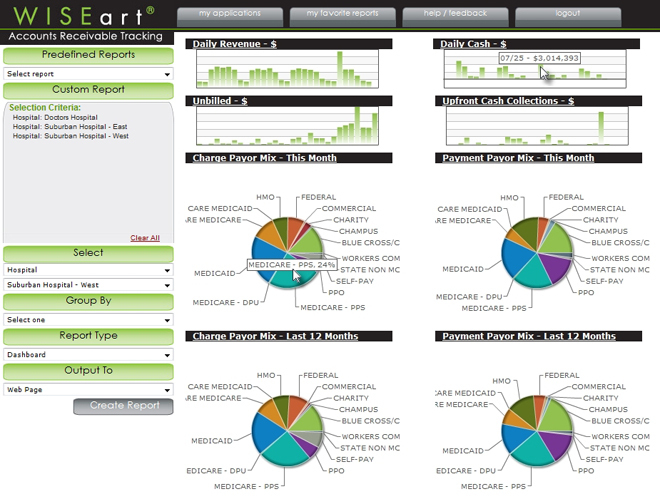 WISEart provides rollup capability for multi-facility healthcare organizations and the functionality to drill down from summary reports (i.e., insurance and clinical service) to a specific list of patient accounts. Click on the report icons below to view larger examples. 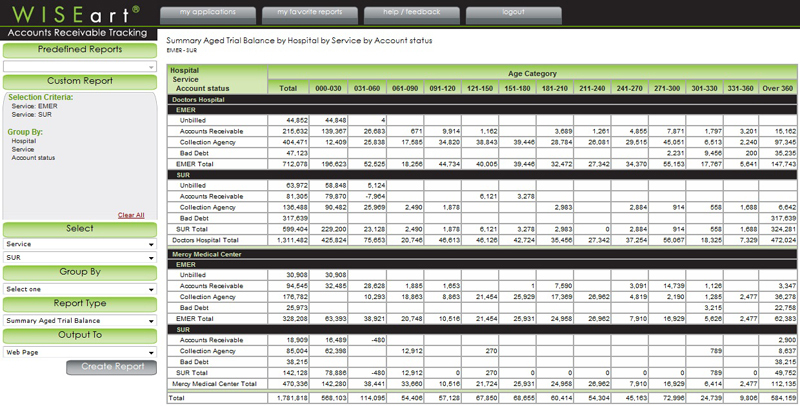 Drill-down from patient and insurance summary reports to detailed reports with a specific list of claims. Run your accounts receivable aging by service date, post date, first billed date, and last billed date. 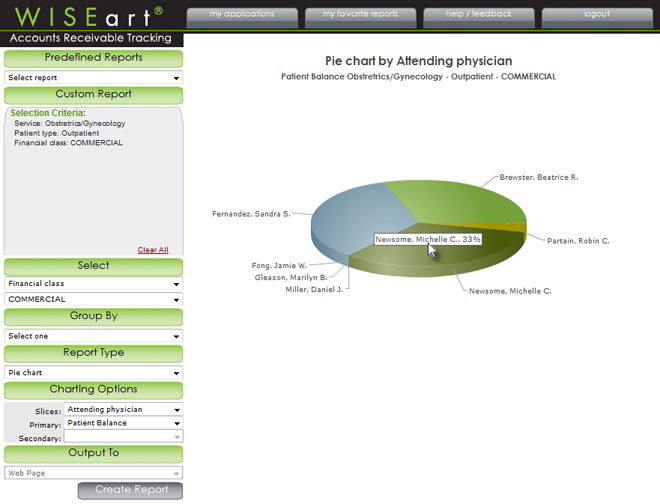 WISEart reports can display accounts receivable by balance range, as pie charts, bar graphs and in dashboards. The hidden power of the dashboard and other graphic display in WISEart is its interactivity. Each chart supports drill-down reports which can be activated with a few simple mouse clicks. 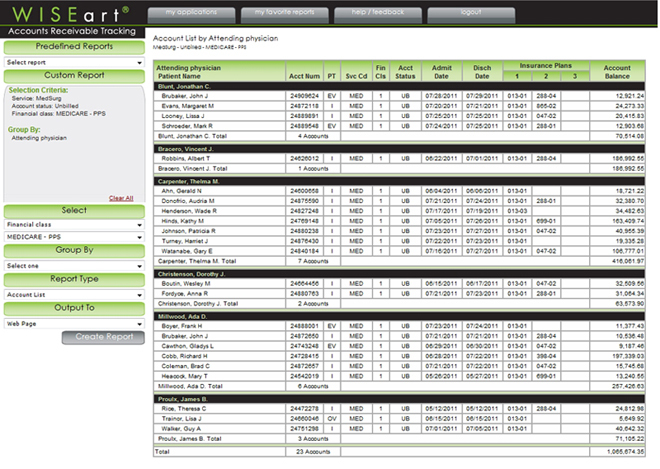 Secure application access, via the Internet, allows users to save and share data online and export reports directly from disparate clinical and financial systems to Excel, PDF documents and even schedule report distribution. For more information on how to have WISEart working for your organization, contact WISEware.